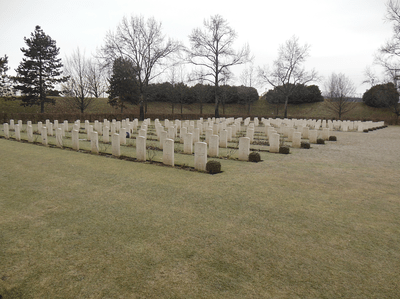 The War Cemetery is in the locality of Adegliacco in the Commune of Tavagnacco, Province of Udine. The town of Udine is about 101 kilometres North-East of Venice. From the autostrada A23 exit at Udine nord. Then follow the signs to Tavagnacco. In SS13 take the exit 'Tavagnacco - Centro Commerciale Friuli' and at the roundabout follow the sign to Feletto-Udine. 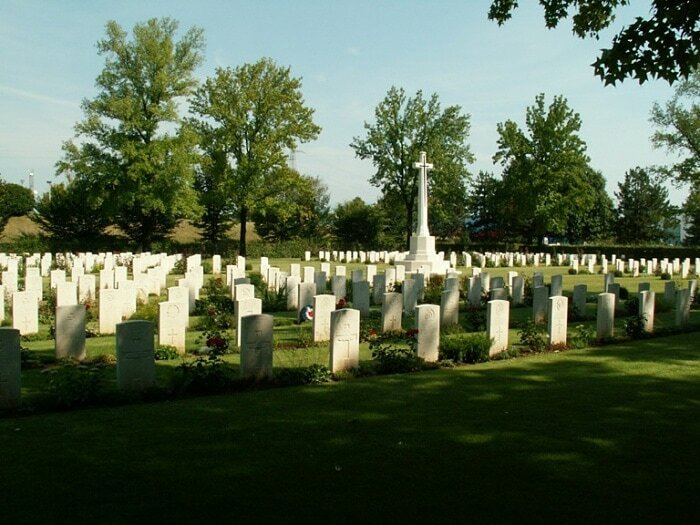 You will see the Cemetery after 100m on your left. From the centre of Udine take via del Cotonificio that otside the city becomes the SS13 towards Tarvisio. After 8.5 kilometres after the city center turn right following the local authority signs to the Cemetery. If travelling by train, the nearest station is Udine in Europa Unita Street. Cemetery address: Via Alfieri - 33010 Tavagnacco di Udine (UD) Friuli Venezia Giulia. GPS Co-ordinates: Latitude: 46.11700, Longitude: 13.22550. 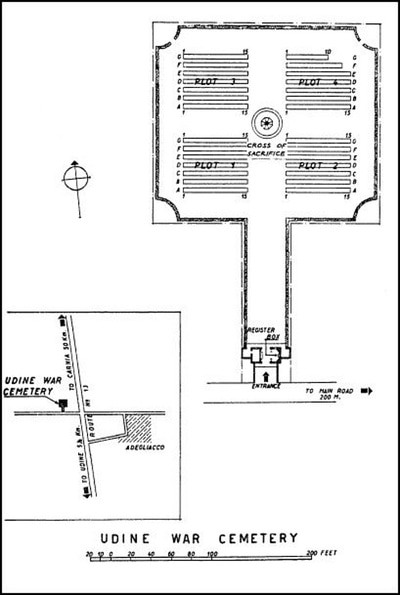 Wheelchair access to this cemetery is possible via the main entrance. On 3 September 1943 the Allies invaded the Italian mainland, the invasion coinciding with an armistice made with the Italians who then re-entered the war on the Allied side. The Allied advance was stalled for two successive winters: in 1943 on the German defensive position known as the Gustav Line, stretching from the river Gargliano in the west to the Sangro in the east, and in 1944 on the Gothic Line in the northern Appenine mountains. At the beginning of April 1945, the Allies launched their final offensive against the German positions spread out in a line across Italy, south of Bologna. German resistance was by now beginning to disintegrate and the Allies were able to fan out rapidly across the Po valley. Udine was entered by troops of the 6th Armoured Division on 1 May 1945, the day before the German surrender in Italy. 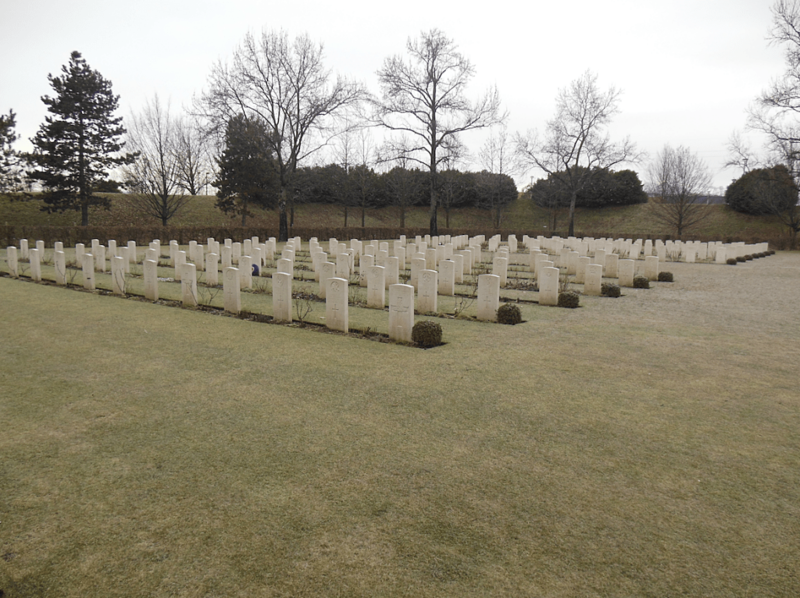 Burials in Udine War Cemetery include casualties from the last few days of the war in Italy, some earlier prisoner-of-war and air force casualties, later garrison burials and some made from 70 British General Hospital which was at Udine for several months from May 1945. The cemetery now contains 414 Second World War burials, 14 of them unidentified. 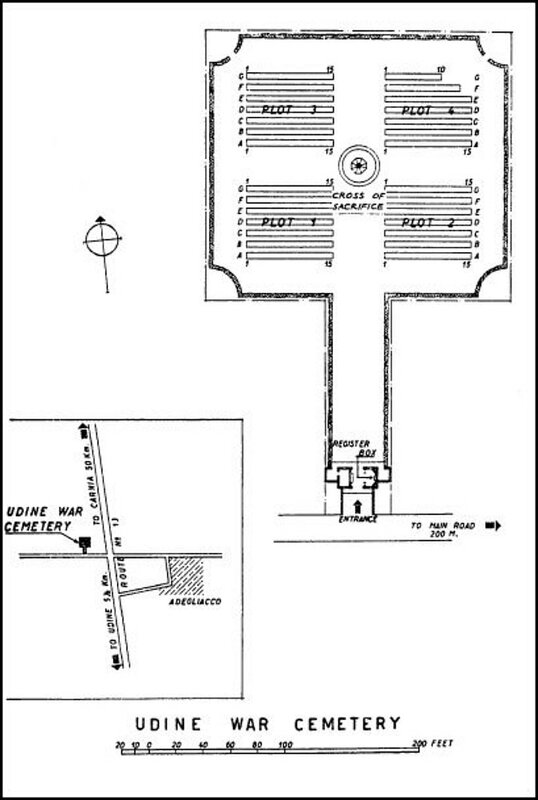 It was designed by Louis de Soissons. 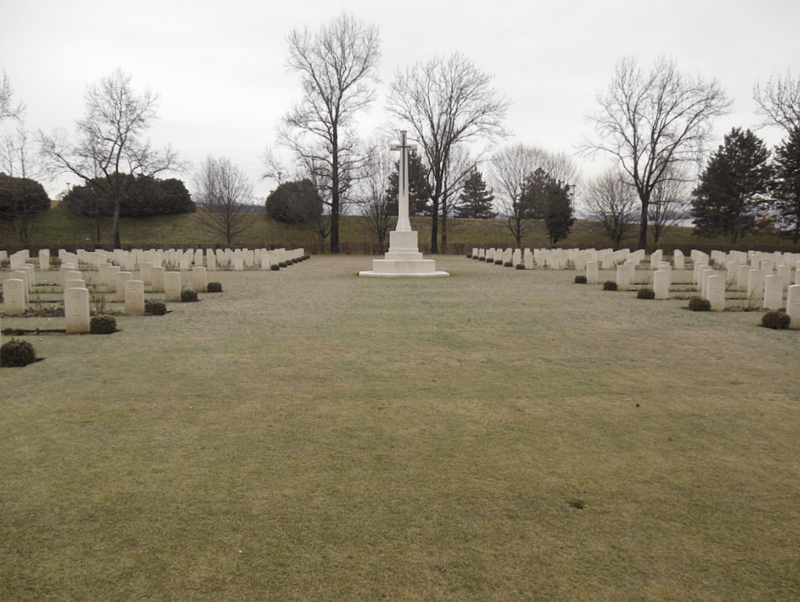 There is also one special memorial in the cemetery, commemorating a soldier of the First World War who was buried at the time in Versa Communal Cemetery, but whose grave is now lost.